Free Cupcake at Price Chopper – TODAY ONLY! 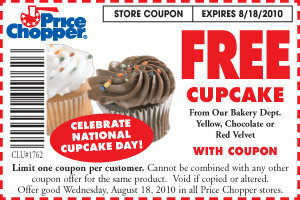 I know I’m probably just adding fuel to the fire, but Price Chopper is offering a FREE cupcake (yellow, chocolate, or red velvet) with this coupon from their Facebook page – but you better hurry, because the offer is good TODAY ONLY – Wednesday, August 18. I think I might head over there at lunch today to see if their red velvet one is any good. Next Next post: What Do Paula Deen, Luther Vandross, & the Wisconsin State Fair Have in Common?